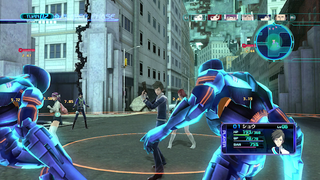 So, OK. On one hand, the boringly-titled Lost Dimension looks like a pretty typical turn-based strategy-role-playing game, with anime graphics and a bit of a Valkyria Chronicles flair to it. Tactical RPGs are awesome! You carefully plot out movement, work to flank enemies and chain attacks, spend time thinking about using the perfect attack, support or defensive ability! And then after a successful combat mission, you come back to your base of operations, chat for a bit with your 10 other psychically gifted allies, and then doom one of them to be erased from existence. That’s right, there are traitors in your midst, and the only way to suss them out is to establish bonds within the group of warriors — the only group capable of preventing the world from being obliterated at the hands of the evil extra-terrestrial being literally called “The End.” After using your psychic powers to rifle through your allies’ minds, there’s a short trial and then the one found guilty of being a traitor is erased. Ominous, right? Well the worst part is that you won’t find out until the final battle with The End - if any in your party left are traitors, they’ll turn on you, making the battle that much harder. Oh, and because we couldn’t make it that easy, traitors are chosen at random for each playthrough. Good luck!